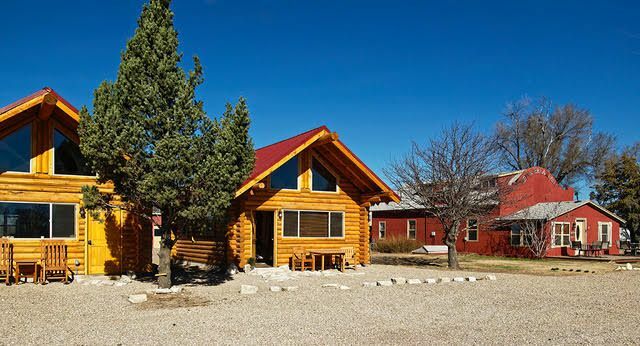 Our wonderful Lodge Pole Log Cabins are now ready for your reservation! After reviewing cabin amenities below, click here to make a RESERVATION and secure your stay with us today. Don’t want to cook your own breakfast? We have you covered! When you make your Cabin reservation you can select to add breakfast(s) to your stay for only $10 per person per breakfast! The Lodge Pole Pine Logs originated in the Western slopes of Montana. The scent of the log pine is an amazing natural sleeping aide. The trapezoid windows are experienced from the loft and provide a Kansas morning sunrise that is food for the soul. Both cabins have wonderful amenities for your traveling comfort! Hairdryer, ironing board and iron. Walking distance to the highly rated “Western Trail Cafe” that serves fresh entries. Known for their great hamburgers and rib eye steaks.